Did you know that 80% of first-time horse owners sell their horse within two years or less? This is a heartbreaking story that I hear about all too often, but it doesn’t have to be your story! The reason why 80% of first-time horse owners sell their horse is that they become overwhelmed, frightened or unprepared for what happens. Keep reading to learn how you can get started in the right direction and find the confidence you need to make an informed decision. My name is Kim Wende, I’m a professional horse trainer/educator with 40+ years of experience. 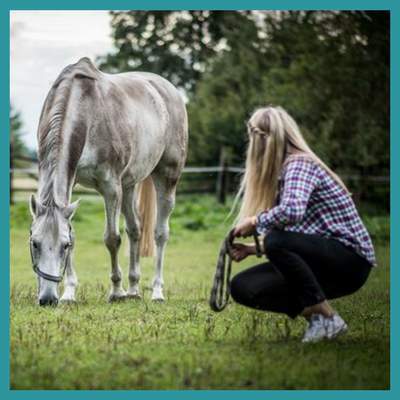 I’ve written a step-by-step guide to help you with buying or leasing your first horse, pony or miniature for you or your child. It’s so exciting to get your first horse, but there’s a lot that goes into owning one. If you’re not prepared you may find yourself selling the horse because of overwhelming, fear and lack of knowledge. It doesn’t take long to get attached to the horse with their big soft eyes, petting their soft coat, their warm breath on your skin and hearing their nicker when they see you. If you have to sell them it’s heartbreaking. Don’t let this happen to you! Instead be prepared and get this guide – it will provide you with the information you need to shop for and care for your own horse. When you’re prepared you will have the confidence to take care of your horse and can develop a lifelong relationship which is very rewarding. ***Don’t be one of the 80% that fail and walk away with a broken heart because you have to sell your horse! Get this guide today!